Bottle Conditioning, also known as “bottle refermentation,” is the original method by which beer in the bottle is made sparkling. Today, most beer gets its carbonation from the injection of exogenous carbon dioxide under pressure. The bottle-conditioning technique involves bottling beer that contains little or no carbon dioxide and then adding priming sugars that yeast will ferment in the bottle. This refermentation (so called because it is performed after the original fermentation of the beer is already finished) gives off carbon dioxide, which dissolves into the beer, giving it natural carbonation. In this context the word “condition” refers directly to the carbon dioxide (CO2) content of the beer; brewers refer to “bringing a beer into condition.” Bottle conditioning, when done properly, can result in a beer with a finer, silkier texture of carbonation, superior foam retention, more complex flavors, longer shelf life, and better aging ability than beers that are “force carbonated.” As a rule, the technique of bottle conditioning is capable of producing some of the world’s most sophisticated beers. In commercial practice, however, bottle conditioning has never been a simple affair. Until the Middle Ages, almost all beer was consumed flat, that is, without appreciable carbonation. With the advent of modern barrel making, the <?Insert-Figure ID="acref-9780195367133-figureGroup-002010">world saw the first vessel that was physically able to hold a carbonated liquid under pressure. In those days, however, brewers had only a dim understanding of fermentation and very little knowledge of yeast. Barrels were made strong to withstand continuing fermentation over time, which often occurred whether the brewer intended it or not. Eventually, however, they learned that carbonation in the sealed barrel could be induced by the addition of extra wort or other sugars after the main fermentation had finished. See barrel. As small-scale commercial bottle manufacturing emerged in the 1600s, brewers and vintners alike showed interest in bottling their wares. Although carbonation was then considered a fine quality for beer, it was generally considered a detriment to wine. Brother Pierre Pérignon, later better known as Dom Pérignon, became treasurer of the Abbey of Hautvilliers, in the Champagne region of France, in 1668. Among his duties was the management of the abbey’s cellars. Here, fermentations often started off in the autumn after harvest, but weather quickly turned cold and fermentations would cease, only to start again spontaneously in the spring. Any resulting carbonation was considered a problem for bottled wine because the weak bottles of the day would often burst under the pressure. Ironically, far from being the “father of Champagne,” Dom Pérignon did everything he could to prevent wine from refermenting. Even once sparkling wine became fashionable, throughout the 1700s only a few thousand bottles of Champagne were produced annually, and half of them were lost to bursting. Brewers, however, fared better. By the 1700s they were well accustomed to the production of sparkling beverages, and they used that knowledge earlier, better, and faster than did the winemakers. This is not surprising since the average brewer might have dozens of opportunities a year to produce beer, but the winemaker had but one chance per season. Belgium, England, and Germany took the lead. In Belgium, the development of bottled gueuze, where young, partially fermented lambic beer is blended with older, fully fermented beer, gave Belgian brewers an increasing understanding of bottle refermentation. In traditional gueuze making, which was often carried out by an independent blender, the young beer, still containing residual sugars, provides the sugar for the secondary fermentation in the bottle. See blending houses and gueuze. Trappist monastic brewers, who were far more learned than most other brewers of the day, further developed the techniques for other types of beer as well. The British led the way in the manufacture of strong bottles specifically designed to hold high pressure. By the late 1700s, newspapers in Calcutta carried advertisements for bottled India pale ale. No matter how it is carried out, bottle conditioning requires absolute cleanliness in both brewing and bottling. The beer will have sugar added to it and then spend a period at warm temperatures; this is a perfect environment in which to grow any unwanted spoilage organisms. The simplest and oldest form of bottle conditioning involves adding a measured amount of sugar to freshly fermented beer and bottling it immediately. This is the technique used by most homebrewers who bottle their beers. This technique uses the original fermentation yeast, still suspended in the beer, to consume the added sugars and produce the carbonation, usually within a few weeks. This method, although it is common among amateur brewers and usually works perfectly well in that setting, is not suited to commercial brewing. Yeast that has just performed a primary fermentation is not the best candidate to perform refermentation. At this point the yeast is in a depleted state and is in a low pH environment, stressed by its own ethanol in solution, and will be further stressed by the pressure building in the bottle. Such yeast may or may not perform the task at hand suitably or within a predictable period of time, which is why most commercial brewers introduce new yeast for bottle conditioning. Sometimes this yeast is of the same strain that fermented the original beer, sometimes it is another brewing yeast strain, and sometimes it is a wine yeast; the aggressive strain Pris de Mousse, often referred to as “Champagne yeast,” is a popular choice. The most effective methods involve the removal of the original fermentation yeast before redosing. This allows the brewer to be certain that the bottle contains only fresh, healthy yeast of the strain desired. At this point, the amount of priming sugar, which will fuel the refermentation, must be calculated. The amount is dependent on three factors: the carbonation level desired in the finished beer, the CO2 content of the beer at bottling, and the amount of fermentable sugar still remaining in the base beer. Most brewers will seek a carbonation level between 2.5 and 4 volumes (5–8 g/l). The former value is typical of most bottled beers on the market, whereas the latter value typifies the higher carbonation with which Belgian specialty beers are particularly associated. To determine how much fermentable sugar the base beer still contains, the brewer performs a test called a “rapid fermentation,” colloquially called a “rapid.” By adding a large amount of yeast to warm beer in a flask and preferably stirring it for 24–48 hours, the brewer can see how much further the beer ferments; this final gravity becomes part of the refermentation calculation because the beer is likely to reach this value during the refermentation process in the bottle. Failure to take this residual fermentable sugar into account can result in over-carbonation and attendant gushing or, at worst, bursting bottles. Even beer that seems to be flat will contain carbon dioxide. This can be measured with sophisticated equipment, but lacking this, brewers can assume that most beers fermented at temperatures around 20°C (68°F) will contain approximately 0.75 volumes (1.5 g/l) of CO2 after fermentation. This small amount of CO2 figures into the equation. The amount of carbonation in the bottle after bottle conditioning is a function of three simple parameters: how much CO2 is already in the beer, how much total fermentable sugar is present after priming sugar is added, and how much of that fermentable sugar will actually be consumed by the refermentation yeast. For most applications, priming sugar will be between 8 and 12 g/l. See priming sugar. Priming sugar is usually glucose, dextrose, or sucrose, all of which produce clean flavors and are highly fermentable. These are available either in granulated form or in syrups, the latter typically containing an average of 66% sugar solids. In either case, the sugar will be added as a hot syrup, with the heat having guaranteed the syrup’s sterility. Once the syrup is evenly blended into the beer, the yeast is added. Yeast concentrations will vary depending on a wide range of parameters, including shelf-life expectations, the desired appearance of the beer, and the time within which the brewery requires the refermentation to be finished. Typical additions range from a low of 200,000 cells/ml to a maximum of 2 million cells/ml, with about 1 millions cells/ml found suitable for most types of beer. Although it is possible to grow yeast specifically for this purpose, today many breweries use reconstituted dried yeast for refermentation. Modern dried yeast production techniques provide a range of excellent strains that can be used for refermentation, and the use of dried yeast allows the brewer to make the yeast addition highly accurate and repeatable. See dry yeast. After the yeast is blended in, the beer is bottled warm, usually at 15.5–21°C (60–70°F), and the bottles are placed into warm storage at 21–25°C (70–77°F). Although it is possible to bottle the beer cold and allow the bottles to warm up in storage, this technique often results in stuck refermentations because the yeast may not emerge from dormancy. The onset of refermentation should be rapid and is generally complete with 2 to 3 weeks; many brewers find that a short period of cold storage thereafter is beneficial for flavor and appearance. 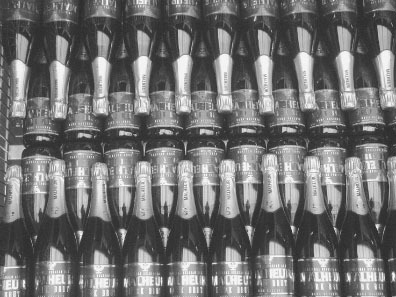 Except for those few wishing to make some nod toward Champagne, bottle-conditioned beers do not undergo the processes of remuage and dégorgement associated with the méthode Champenoise, where the yeast is settled into the neck of the bottle and then removed after refermentation. For beer, the yeast is allowed to settle to the bottom of the bottle, where it can continue to help the beer evolve over time. Because they are restricted by the “German Beer Purity Law,” German brewers use a different technique for bottle conditioning. See reinheitsgebot. Rather than adding priming sugar, they add a precisely dosed blend of wort and yeast called “speise,” a word meaning “food.” The speise provides both the fermentable sugar (along with unfermentable wort sugars) and the yeast necessary to perform the refermentation. This is most often seen in the production of traditionally bottle- conditioned hefeweizen (weissbier). However, most hefeweizen on the market is bottled with yeast, but is pasteurized beer that has not undergone bottle conditioning. Fortunately, some artisanal brewers continue to produce bottle-conditioned hefeweizen. The rise of filtered beer styles and the pressures of modern commercial production saw a decline in bottle conditioning over the 20th century. Some breweries, rather than abandoning bottle conditioning altogether, developed variants on the traditional techniques. Most beers bearing labels that claim that they are “bottle conditioned” are in fact only partially so. Partial bottle conditioning initially involves force carbonation of the beer, usually to about 2.2–2.5 volumes (4.4–5 g/l) of CO2. This carbonated beer is then dosed with a smaller amount of yeast and priming sugar, and the beer undergoes a somewhat truncated refermentation in the bottle. Even some of the famous Trappist beers are now made by this method, which is obviously capable of producing very pleasant results. The modern technique has many advantages, including shorter refermentation times, the ability to add less yeast in the bottle, lower oxygen pickup on the bottling line, and something of a safety net should the refermentation not finish properly. However, both tasting and analyses clearly show that full bottle conditioning provides for more complex flavors in the finished beers. With the rise of craft brewing worldwide, bottle conditioning is once again on the rise, if only on a relatively small scale. Some larger breweries have taken up partial bottle conditioning of a belief that the active yeast will remove oxygen from the beer and extend shelf-life, but this is only partially true. Yeast can remove small amounts of dissolved oxygen from beer, but very little from the bottle headspace air, which means these benefits will only attain to breweries using sophisticated brewing methods and very good packaging equipment. An increasing number of small artisanal breweries are using bottle conditioning to rediscover the complexity of flavor, aroma, and texture the process can bring to their beers. Producers of modern sour beer styles are using bottle conditioning to advance the effects of bacterial strains added in the bottle. The addition at bottling of alternative yeasts such as Brettanomyces can produce a wide range of potentially desirable aromatics as well. Like the affinage of traditional cheese, bottle conditioning is a traditional but difficult high-wire act that can bring about wonderful results when applied by skilled and judicious craftspeople. See also brettanomyces and sour beer. Guy, Derdelinckx, B. Vanderhasselt, M. Maudoux, and J. P. Doufour. Refermentation in bottles and kegs: A rigorous approach. Brauwelt International 2 (1992): 156–64. Jancis, Robinson. The Oxford companion to wine, 3rd ed. New York: Oxford University Press, 2006.